It addresses prospect skepticism & risk aversion. When you open an opportunity, or get stuck in a selling process and really need to be entrepreneurial, the Proving Kit helps move the process forward. 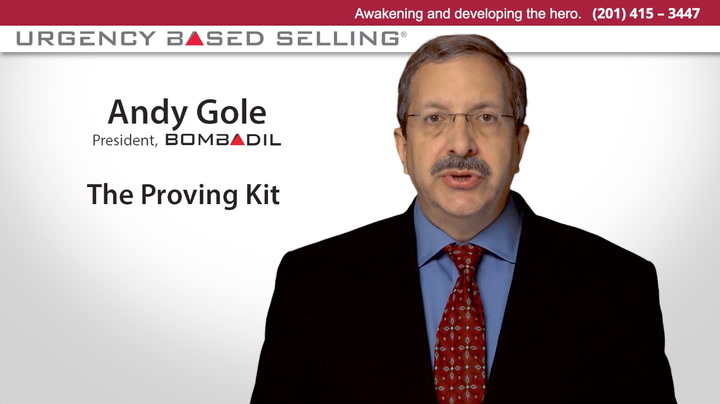 The proving kit does 2 things for the salesperson: first, it helps make the case as to why the prospect should do business with us. And second, it addresses the prospect’s skepticism & risk aversion. This kit includes hard hitting messages which invoke powerful visual metaphor to quickly and strongly make our case. It also includes proof statements like testimonials which have 2 key features: the before & after case, and the psychological journey the prospect takes in selecting you.